here are just a few notes! Thank you everyone, your feedback means the world to me. WOW! I am FLOORED, Alicia, this is so much better than I ever dreamed of! My God, I don't even have the words to tell you how much I love what you have done! I'm just so impressed with your talent! I wish I had even an eighth of your ability! 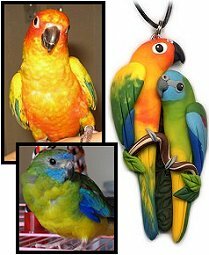 I just want to let you know I was thrilled with joy when I received the 3 pendants of my Sun Conure and Parakeet today. I am very delighted with your wonderful craftmanship. 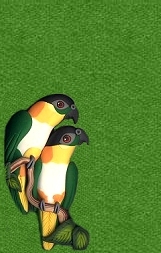 You really captured the colors of my two parrots as well as their expression ! I put one of the pendants on immediately and it looks great ! Thanks again for your wonderful work and service ! My Goffin set flew in today! What a beautiful surprise! Your pictures are very good on your website but in person this necklace is really beautiful. I know that most Goffin cockatoos look exactly alike but this looks so much like my Chloe bird that it could be real! Even the beak looks real! I don't know how you've done it but you have a true gift. Thank you for sharing your talent. Hey! I got the pendant in the mail today, and I am very excited! It's perfect, and I loved the card you sent with it, too. I want to wear it every day, but I also don't want to wreck it! Beautiful work, I'm very pleased. The pin and charms arrived safely today and I knew they would be made to perfection and they were. 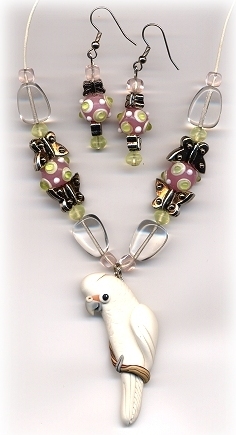 All three of the pieces you created are just great...and resemble "Gussi" so well. And the bonus of the nice card was a surprise. It's too bad there aren't more business folks like you in this country, it's been fun and refreshing to deal with someone that truly takes pride in their work and is extremely accommodating and friendly. Thank you for your prompt service and willingness to share your talent. Don't be surprised if you hear from me again some day. I hope that you stay well and don't work too hard. They are wonderful!! Thanks for sending me the pictures, I can't wait to get them. Of course I knew they would be beautiful :-) Your work is so precise, right down to the horn colored upper beak on the Blue Crown. 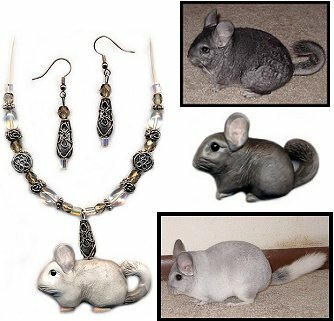 I saw this type of jewelry on another site and the beak was grey :-( This just shows that you take pride in your work and you make them true to life. Thanks so much. I am so happy I found your website!! I just wanted to tell you how happy my Grandmother was to receive the lovebird pin. She said it was the best Christmas gift she has received in years. Thank for taking time out of your busy schedule to help me. I hope you had a wonderful Christmas. She is planning to write you a little note to say how much she loves her pin. She's planning to wear it to her next avian society meeting and will be passing out a few of your business cards. P.S. She said the pin looks exactly like her Gypsy. Sorry I couldn't talk with you personally. I was totally awestruck, blown away when I opened the package today. You really were able to capture the birds "essence" so well. I'm thrilled with the necklace and will wear it and treasure it. Naturally, I had to put it on immediately and it was noticed by all who came into our dancewear store. 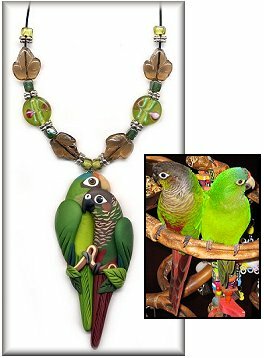 I have photos of my birds on the computer and everyone was amazed how much the necklace looked exactly like my girls. You seem to have a psychic feeling in your work . Tu-ki (G.C.) particularly, is awesome, even to the lower mandible. Thank you for your time, your gift and for the great customer service. I will keep your site book-marked for future and hope to order again , for myself and for gifts. First of all, I hope you are doing okay! Just wanted to let you know that there were tears in my sister's eyes when she opened her gift! 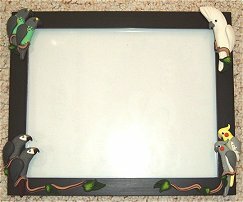 At first she thought it was a "generic" frame that I found -- but when she realized that it was custom-made with all 3 of HER birds on it -- well, that's when the tears came. I explained to her how you weren't feeling well but agreed to make the frame anyway, and it made the gift even more special to her! She has asked me to thank you for your kindness -- and your craft!!!! And what can I say? You already know how much I truly loved it. Being able to lift my sister's spirits right now was worth more to me than I can ever say! Thank you so very, very much - and I wish you all the best!!!!! I received the pins, pendant, and ornament today, and I just wanted to tell you how thrilled I am. You did such a beautiful job on them all, I wish I had half the talent you do!!! 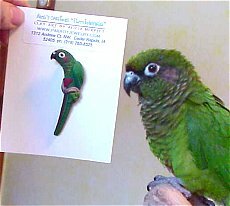 You captured Asha so well in the parrot angel pins and the pendant, my heart jumped when I opened them. Everyone is begging me to know where I got them! Again, thank you so very much for taking the time to make them for me. They are truly something to cherish. Thank you so much! 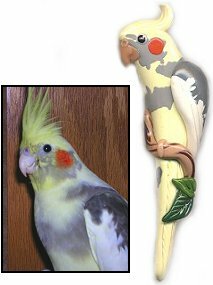 My husband and I are both amazed that you created such a great likeness of Peeper....images of Meyer's parrots are hard enough to find, but your work really captured our bird's personality as well. It is a treasure! I just HAD to write to tell you that I got my order. The MBC pin is ADORABLE!!! The Ornament is so cute I can hardly handle it, and the sun is almost too cute to send to my friend!!! I JUST LOVE THEM ALL!!!! Thank you so much!!! I have put the whole holiday collection on my wish list for next year! The pictures did not do them justice AT ALL...They were adorable in the pic, but in person...WOW!! I have had the week from hell, and this just made it all better! You are a very talented artist! Attached is a pic of the ever precious-spoiled-darling Zoe with the pin. She is a little puffy looking because I was running around excited with her, and then there was bubble wrap...and she is just a little excited now too! LOL It looks so much like her!